After covering Action #1 on the first segment, we jump to the Silver Age of comics [Sorry, I am not following chronology here]. 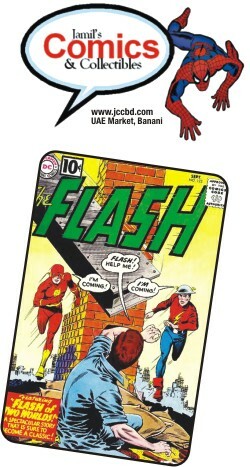 In 1961, Flash, the herald of the Silver Age gave the first glimpse of parallel worlds in issue #123; Earth-2. This was the beginning of the infinite universes. Soon we would be introduced to Earth-3, Earth Prime and the other earths. Earth-2 was perhaps created out of nostalgia. The superhero comics had suffered a severe downturn in the 50s, when crime and horror comics ruled. Many major titles like Flash, Green Lantern, All star Comics (JSA), Captain America had been cancelled and only a few - including Superman, Batman and Wonder Woman remained in circulation. To adapt to the times, DC Comics, perhaps the only strong publisher of superhero comics, made some radical changes. In Showcase #4 (1956) DC introduced a new Flash, Barry Allen. Barry was quite different from the original Flash, Jay Garrick; his origin was unique, as was his world. Soon after in Showcase #22 (1959) DC gave us the new Green Lantern, Hal Jordan. Hal was a fighter pilot and was 'born without fear' - a far cry from his predecessor Alan Scott. Soon we had the Justice League, born in the light of the classic JSA. DC introduced the new Atom, the new Green Arrow and a host of revamped heroes. There was new interest in comics and superheroes were once again selling well. The new readers loved the new heroes, but the demand to see the classics especially among the older readers was always there. Flash #123 gave the readers a chance to see both their heroes live. This issue was a massive hit and had laid the foundation for the return of the JSA [JLA #21 & 22 (1963)]. Comic fans were treated with many crossovers of the two earths until in 1984 when DC decided to destroy the multiple earths in their event Crisis. But what one crisis taketh, another giveth back - in Infinite Crisis (2005) the multiple earths returned. Time travel and multiple earths - these are two core ideas of science fiction. In comics the multiple earths has a background of love for old heroes. No wonder that notion is so strong. Marvel Comics too published their own alternative earth called the Ultimate Universe, in the year 2000. The world of comics is a world of wonder; and it should not have boundaries. That is the legacy of Flash #123. This is the comics that made the first stepping stone for anyplace and all the places to exist. Maybe, just maybe, there is an Earth where the biggest superhero is from Bangladesh. Where there is no rampant corruption and misery. Our hero meets up with the rest of the heroes to show the path of light and order. Just Imagine! Every major tournament has incidents which are remembered for years by fans. Since Euro 2012 was only a few days ago, there's quite a few in our list of stuff we remember. How many jokes has the boy had to suffer in the last year? An internet sensation, a dictionary synonym for the phrase “missing-the-target”, Fernando Torres came into this tournament probably expecting to be ridiculed. Things didn't get better when Spain, in an attempt to bore their opposition into submission, started with six midfielders, effectively leaving no space for Torres. Now, tournament's over, and to the dismay of many many punters, Torres leaves Ukraine as the Golden Boot winner. Despite being tied with roughly six other players in terms of goal, Torres won out as he played the least number of minutes and had an assist too. Worst striker in the world, right, guys? Former European champions, Greece, have a lot of problems back home; crippling recession and what not. Their campaign can, however, be counted as a moderate success. Beating out the Russians to progress to the second round, they came up against Germany, their bailout-giving masters. Before the match started, they lost their captain Karagounis to yellow cards, one for diving and one for stealing the one Euro coin the ref was using during the toss. The game ended with the second-string German attack running riot and the Greeks watching the goal count rise like their country's debt and/or unemployment rates. The Oranje came into the tournaments with the exact opposite hopes as Torres. They expected to do well. Set into the Group of Death (which some would argue was better than Group C, the Group of Debt), they were expected to make it through, brushing aside a mediocre Portugal and an irrelevant Danish squad. Instead, they failed at every hurdle. The Danes went Viking on them, Mario Gomez reminded them of the German occupation and Portugal bested them with a brilliant C-Ron display. Oranje, with the likes of Sneijder, Robben, Van Persie, Huntelaar, scored two goals in three matches and were embarrassingly dumped out of the tournament. Perennial chokers, eh? It's safe to say there is never a dull moment when Super Mario is around. Be it his, now infamous, shirtless non-celebration against the Germans or setting his own house on fire, he is always in the thick of things. For once though, the fireworks were only on the pitch as Balotelli exploded into life in mercurial fashion to beat the tournament favourites Germany. But a touch of insanity is always on the horizon. Why always him? Ronaldo must have been desperate to silence the barrage of criticism aimed at his international performances. Instead, in the first two matches it looked like the only ability he had was to over-apply hair gel. Chants of 'Messi, Messi' were getting louder. He finally came to the fore against the Dutch and then against the Czechs with three goals combined. But just as it looked like he had silenced his critics, there came the glory-hunting moment against Spain. He wanted to be the one to win it. The plan backfired and they were sent packing after Real teammate Sergio Ramos failed to sky his penalty. Russia came into the tournament as the dark horses. All they leave with are three hefty fines by UEFA because their fans had apparently forgotten about the Soviet Union breaking up. Marching the streets in celebration of their national day, the Russians engaged in scuffles with the Poles and tear gas and rubber bullets had to be used. Their exploits on the pitch however, required no such thing as they exited with a tame 1-0 defeat at the hands of the Greeks. Andriy Shevchenko called time on his Ukraine career after the Euros. A national hero, he will be sorely missed. Player of the tournament, at least for us. That is all.